Frankie is a shih tzu that is part of a very special and adorable family. I was honored to be able to photograph them for their Christmas portraits this year. OK, in my previous post, I featured this image captured in Disneyland. However, I wasn't happy with it, which was just gnawing away at me in the days since I posted it. Finally, I decided to get a purely critical POV from objective eyes, and utilized a critique forum on Flickr. Could this be a better image? Absolutely! I took this with my point and shoot, so I was limited when it came to DOF. I wish the little girl had turned a bit more my way to reveal more of her eye. And I really wish that she hadn't worn a striped shirt. However, I loved the image in that moment. This little's girl's pensive pose will always remind me of that October day in Disneyland on the Rivers of America. I also think the reflection on the banister is kind of cool, and it may not have caught my eye if she wasn't wearing that striped shirt. Please feel free to tell me what you, esteemed reader, think of the image. Was the second edit better? Do they look the same? Thanks as always for stopping by, and for sticking with me through my photographic journey. 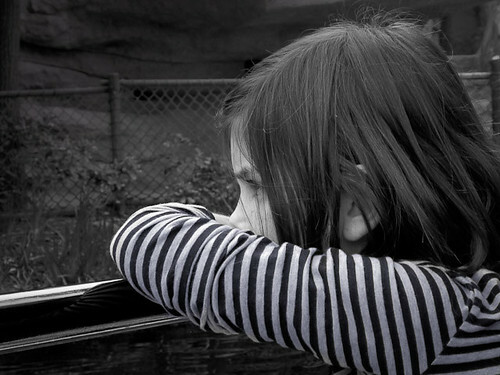 I love the perfect profile of this little girl, and the contrast of her striped shirt to her smooth hair. The reflection of her shirt in the rail is something I noticed but didn't think came out until I started editing the photo. I created this as a B&W image in Lightroom 2 because the colors in the original were competing too much with her stripes. B&W also adds to the pensive mood I felt when creating this image. I couldn't help but wonder what was going on in this little girl's mind as we cruised down the river. I like that you can see a hint of her eye in this portrait, because for me, the photo just isn't worth taking if you cannot see an eye of your subject. My career happens to be Geographic Information Systems, map making for those of you not familiar with the term. Mapmaker, mapmaker, make me a map, find me a location..... (Just imagine Babs singing that!) 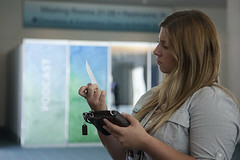 Every year, thousands of my fellow GIS'ers and I attend the ESRI User Conference (the industry conference) at the San Diego Convention Center. 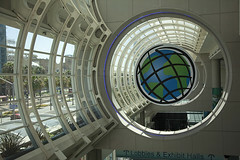 The ESRI logo at the San Diego Convention Center. Attendee Kelly Minniti solves "Where in the World?" 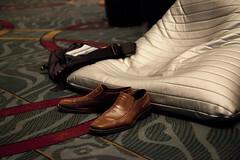 The new GeoLounge allows attendees to kick up their feet for a much needed break. Check out the rest of the set and let me know what you think. 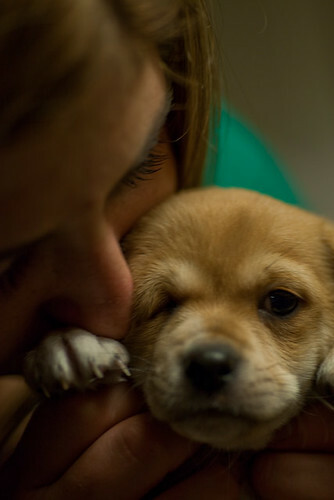 OK, if you don't like puppies, just stop reading. Actually, if you don't like puppies, maybe it's time for a little self reflection. Who doesn't like to at least look at puppies??! The light in both photos is from a Tungsten light to the right of the camera in front of the subjects. Guess which smarty pants forgot to bring their powerful 580EX II flash? That would be me. I love both of these photos because they really show the bond of human and animal, and how tiny and helpless these puppies are in the hands of a human being. 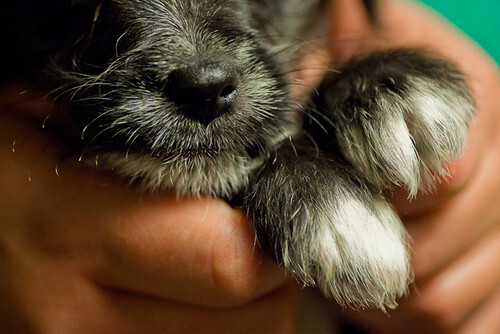 I like the paws and nose detail of the first photo, and the juxtaposition of puppy paws and human hands. So this is another case I couldn't pick one photo of the day for my Project 365ish Photo 65. It's just too hard when cute puppies are around. Thank you Kelly for inviting me to take photos of those precious little puppies! It was a blast chasing them around!